MERCES actions will be pursued through 9 Work Packages (WPs 1-9), with top-down linkages modulated and coordinated by Work Package 10. WP1 will produce a census of European marine habitats, their degradation status and restoration potential, and will provide a synthesis of previous experiences of marine restoration. The WP1 analysis will allow the ‘operative’ WPs 2-3-4 to compare new approaches devised in MERCES with previous marine restoration activities. The information from WP1 will allow the fine tuning of the three ‘field’ Work Packages, avoiding any unnecessary repetition of past unsuccessful trials and experiments. The three operative work packages will put in place different (active and passive) restoration actions in three different marine habitats: shallow soft bottoms (WP2), shallow hard bottoms and mesophotic habitats (WP3), and deep-sea environments (WP4). The results gained by each of the three ‘field’ WPs will be continuously monitored and passed to WP5 in a timely fashion. 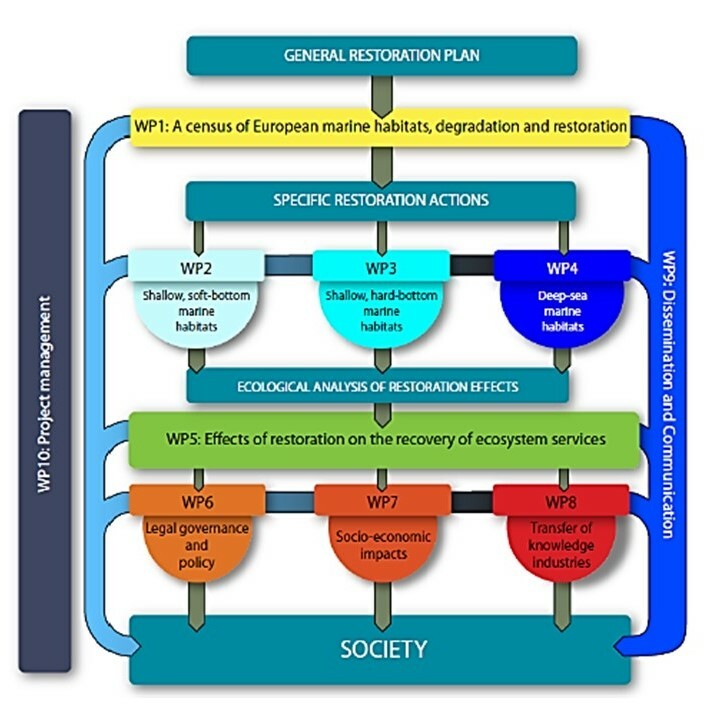 WP5 will analyse the effects of restoration on the recovery of ecosystem services and, at the same time, will serve as a source of information for the two Work Packages dedicated to 1) the analysis of legal, governance and policy issues related with restoration (WP6), and 2) the socio-economic impacts of restoration (WP7). The field and laboratory work of WPs 2-3-4 and the results of WPs 5-6-7 will provide the fundamental knowledge for WP8 engage with industry and put business at the heart of the Restoration Agenda driving new blue-growth business development. WP8 will also bring industry’s voice to the table to influence the direction of the field and laboratory work, and to pose specific industry-focussed questions to experts in law and socio-economic issues. WP9 will disseminate and promote the MERCES outcomes (e.g., tools and guidelines) to multiple and heterogeneous target groups outside the MERCES consortium (excluding industry which is specifically targeted in WP8), from the scientific community to non-specialized (citizenship) audiences and will engage all stakeholders throughout the life of the project. In particular, WP9 will focus on advising policy makers in the European Commission and national governments. Activities of WPs 1-9 and their interactions will be coordinated, modulated and monitored through WP10, dedicated to the functional and administrative management of the MERCES project.